Some interesting new ecologically planning community examples via the wire(s), pushing the boundaries of what is possible on a large-scale, as well as looking at new opportunities for redevelopment of polluted or marginal lands. Overall these offer some interesting precedents to round out the previous examples on L+U. A trio of recent examples by (one from BIG and 2 from Koolhaas/OMA) take a firmly rectilinear view of new developments in three cities. The initial look, via Archidose, at Holbæk Kasba in Denmark elicited the 'what is up with all of the squares???'. On the heels of Foster's Masdar City plan, another group of projects that generated a response that I am sure is shared by many. Not that there is a lack of examples of planning from all shapes and sizes in the built world, but it definitely seems like a trend to the square at least in recent times. The project involves development of a waterfront residential zone with 145,000 sf of 2 and 3br units. 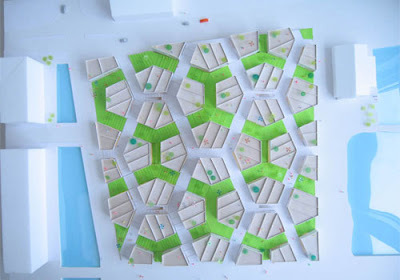 While using the grid as a primary tool, the plan evolved somewhat into an interlocking pattern of spaces. 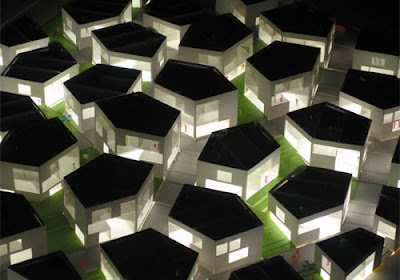 Via Archidose: "BIG started with a generic grid of equal-sized plots of consistent height, "a dense and low kasbah of dwellings that have been twisted and turned thus creating a labyrinth of small open spaces and hiding places for life, play and socializing between the houses." This consideration of the space between buildings -- clearly more interesting in the modified plan than the generic grid -- is something Jan Gehl would definitely appreciate." This development creates some interesting circulation and open space patterns, but is once again seemingly forced upon a piece of land with no reference to anything existing. 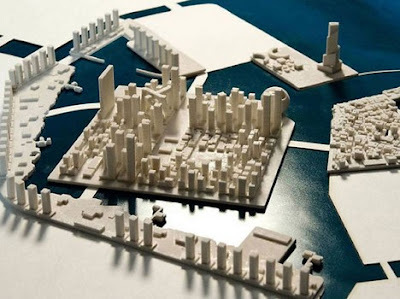 Perhaps it due to infill, where waterfront development increasingly is slated on land that is artificially created (or buildings are developed to float). The other issue with this is some of the monotony that is derived from an admittedly striking pattern. How does one actually feel when in these spaces, both as an inhabitant or visitor? The square, it seems, offers interesting options but perhaps some unecessary constraints. A recently unveiled project from Rem Koolhaas and OMA for Dubai has generated much attention, more for the giant death star or shaped building rather than the overall composition or plan. Dubai is the epicenter of architectural expression - covered extensively with many visuals in Designboom recently as well. 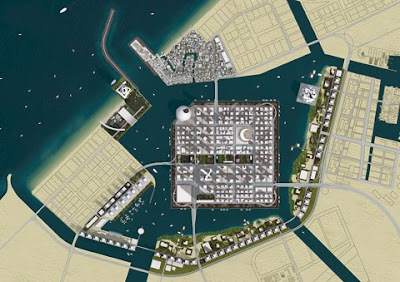 So it is not surprising that another square form shows up in the middle of Dubai Waterfront, via this plan. 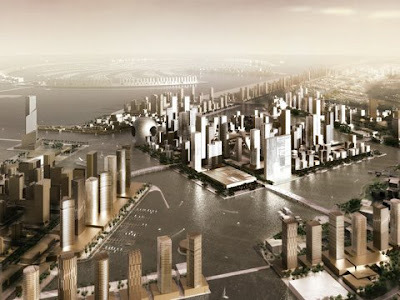 Via Archinect quoting the NY Times, this modest "...1.5-billion-square-foot Waterfront City in Dubai would simulate the density of Manhattan on an artificial island just off the Persian Gulf. A mix of nondescript towers and occasional bold architectural statements, it would establish Dubai as a center of urban experimentation as well as one of the world’s fastest growing metropolises." The best coverage comes via Eikongraphia, always on top of the symbolism of design strategies - this time likening it to the formal layout of Roman cities: "It has strictly square plots in a strictly square layout, with a ‘defense’ something around it in the shape of water and four entry points. More importantly: the grid is punctuated by monuments (icons). All exactly like the Romans designed their cities." The scale of development in Dubai is astronomical, and quite mad in terms of what has been proposed, not just in buildings but in giant-scale. The use of square in this case is counterpoint to some of the symbolic excess at work within the waterfront fringe. Again Eikongraphia: "What I like about the plan of OMA is that it uses water to draw a square in the desert landscape of Dubai. 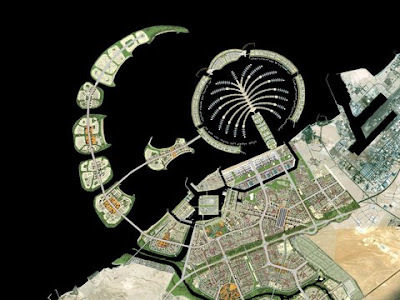 At a much larger scale this strategy could provide a serious counterpart for the land-art of the Palm-islands, The World, Waterfront, and The Universe." Finally, the most similar plan to Masdar in form and context, is the Ras Al Khaimah’s Eco City in the United Arab Emirates. From Inhabitat, the project has similar lofty ecological goals such as: "...Cutting-edge solar technology will power the 1.2 million square meter city, built using locally-sourced Arabian materials and aesthetic styles to support the city’s overall ethos of sustainability." Although it's difficult to detect in visuals, Inhabitat reports that "...cunning planning means that the least amount of direct sunlight will strike the city’s buildings during the warmest times of day. Lots of narrow streets and open green spaces have also been incorporated to increase natural lighting, shading and resident happiness." 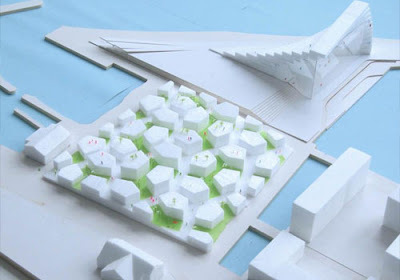 It makes sense, as lack of context and variation of topography and setting make it possible to apply a very stringent plan of forms that could create a particularly well calculated environment. The closeup seems to offer some interesting microclimates due to open space and building forms. It too seems to have a death star of it's own, which is set to become a signature element (I say this with a hope for some alternative). Perhaps with all of that square-ness, a sphere is just the contrast you need. Either way it does give these developments some Star Wars qualities, so I guess a futuristic scenario should be green, right? The question of viability of these square scenarios is worth exploring further - and of course it will interesting to see how they all go in the ground. While the form of a city is one aspect of the experience - it does seem to have significant impacts on the overall layout and performance. Will squares make good communities - applied as they are in ways that defy organic laws? Or in the lack of real context, does anything go? The use of pure form in design is commonplace. In planning, the scale and implementation of form makes adhering to a strict geometric more difficult (look at the US Public Land Survey System as an example). When delving into ecological planning, the response to topography, geology, hydrology and natural systems requires some additional flexibility in form. It's bad enough to restrict ecological systems to politically defined property lines. 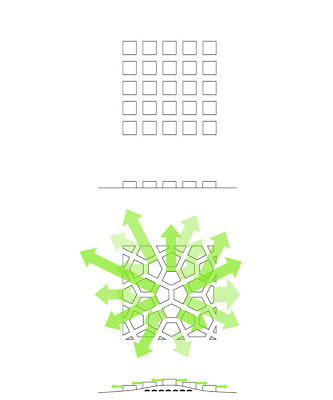 To add more constraint through imposition of a perfect square, we become slaves to the grid, and may miss potential opportunities to overlay nature in meaningful ways, as well as to create places of mystery and interest for the eventual users.